Dale Mann was an artist, a father and a friend. He came to work with me in 2006, by accident at first, when he first came to live in Sudbury. He needed an income to support his Art work. 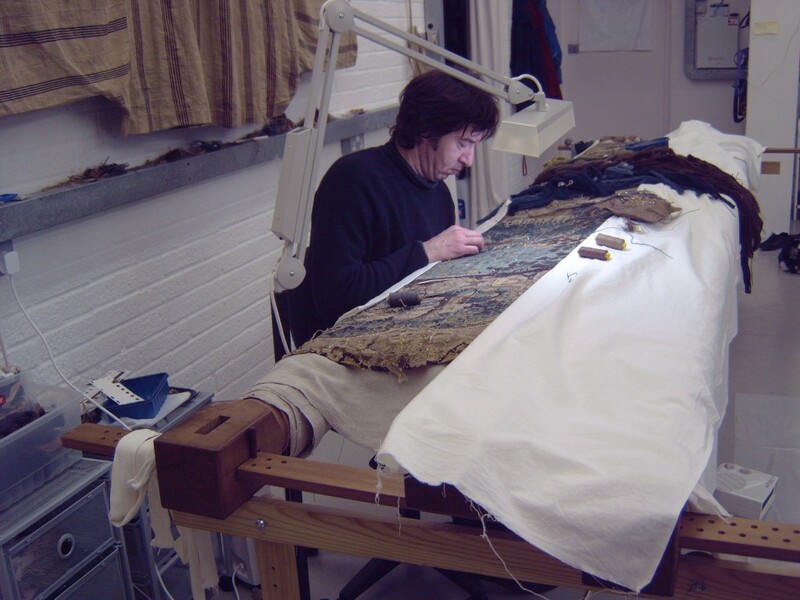 He started by working alongside me on tapestries and as he became fascinated by the beauty of tapestries and their designs, he quickly developed his skills in conserving them. Dale also proved to be the most inspiring and fun, all-round conservation assistant, who then became an important driving force in the opening of this Studio at the Stour Valley Business Centre in 2007. He had the vision and energy to transform an abandoned workshop into a wonderful working space that all of us still enjoy working in today. It was with enormous sadness that we heard of his passing in April. Here he is pictured fully immersed in his work on a tapestry.